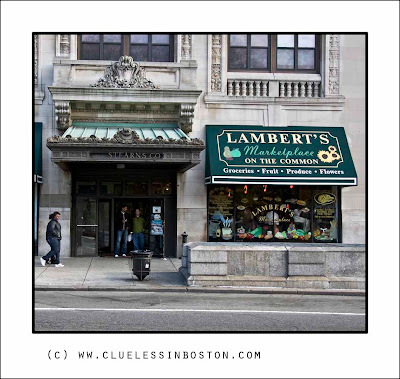 This weeks doorway is the R.H. Stearns building on Tremont Street. R. H. Stearns was at one time a major department store in Boston. It is now an underused building with half the main floor vacant (not shown) and the other half a deli. The grandeur of the main entrance harkens back to a day when there were multiple local department stores in Boston: Raymonds, Gilchrist, Jordan Marsh, Kennedy's, and my favorite: Filene's. It is a pattern duplicated in most cities and we are now left with just Macy's :( in downtown Boston. Intersting story, it's a pity to loose these building, which sometimes are really spectacular. Something like this is happening here, obviously in a small town scale, but it hurts. Grand entrance. Department Stores are almost a thing of the past. You can still find the odd one in the UK, but they suffer from seeming to be in a 1950s time-warp. Sad. I don't know all the names you're talking about (except macy's). But the door is wonderful, and the place still seems to be very inviting! Adorable picture!They could do beautiful Christmas decoration inside this store! This is such a fine composition...beautifully balanced. What a grand old building! Sad that it is underused. The unhappy effects of standardisation. Grand doorway all the same. The awning and decorative work of this doorway are beautiful. Thanks for "seeing" it and sharing. That is some doorway! Very nice. I like this -escpesially the colours!